If used widely, the technology not only creates a vast new application for light, but could also expand our limited wireless capacity. Paraskevopoulos and his colleagues made a slight change to the LED circuitry with a simple modulator that enables the device to transfer data optically, he said. The LED flickers, but in a way that’s far too fast for human eyes to perceive. They were able to transmit data from lights in the ceiling fast enough to send four high-definition videos to four laptops simultaneously. This optical approach to data transmission is viewed as a sustainable form of communication that doesn’t create electromagnetic interference at low frequencies, like the current wireless networks do, which would be beneficial for some areas like airports. And with the cost of LEDs expected to continue going down, they’re likely to be a more economically viable option in the future. 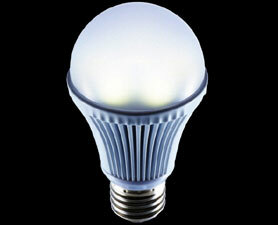 Research is also focused on LEDs because they offer several advantages over compact fluorescent lamps and incandescents. Solid state lighting devices, smart lighting researchers argue, are better for the environment because they don’t contain substances like mercury or phosphor. They won’t smash when dropped, and have the capacity to last for tens of years. Researchers from around the world, including the United States, the United Kingdom, Japan, and China have been making strides in the field of smart lighting. So-called “smart lights” built in the lab have broken data transmission records. Even the Fraunhofer researchers set a record in the lab with one that could send 800 megabits per second — far faster than the 100 megabits per second rate from their commercial bulb hack. The Fraunhofer researchers want to show the lighting industry how easily it can be done. They will be exhibiting their prototypes at the international IFA consumer electronics trade show in Berlin next month, Paraskevopoulos said. He and his colleagues believe that a major switch to LEDs, in office and industrial buildings at least, will happen within five or six years. iPhone 4S hogging Data Networks!